During the 1970s, there was great interest in the sport of running. It was part of a healthier living trend, and there was much optimism that long standing track and field records could be broken. Interest in the Boston Marathon expanded greatly in the 1970s, with a significant increase in participants. A local tradition for Marathoners was to visit the Eliot Lounge after the race. The day bartender, Tommy Leonard, was the official greeter for the Boston Marathon. Some of Boston's professional sports figures used to visit the Eliot also. Boston Marathon paraphernalia adorned the walls of the Eliot Lounge. In 1984, a Walkway of the Running Stars was dedicated to honor marathon history in Boston. 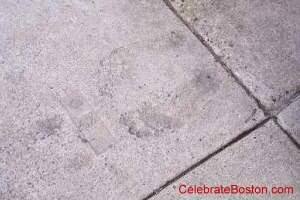 Similarly to the tradition at Grauman's Chinese Theater in Hollywood California, famous running stars in Boston placed their bare feet in the cement outside the Eliot Lounge. Joan Benoit Samuelson (Olympic Gold Medalist, 1984), Johnny Kelley (Boston Marathon Winner, 1957), Amby Burfoot (Boston Marathon Winner, 1968), Bill Rodgers (four time Boston and New York Marathon Winner and local sports hero), Boston Marathon contenders Bob Hodge, Vin Fleming, Kevin Ryan, Pattie Catalono, Boston College coach Randy Thomas, and Tommy Leonard, cast their bare feet in the new walkway. Less than ten years later in 1993, the cement sidewalk (and the Walkway) were torn up. In an attempt to keep tradition, a smaller version of the Walkway was again cast in concrete. Bill Rodgers, Tommy Leonard, Bob Hodge (Boston Marathon contender and local sports hero), Bill Squires (six time Boston Marathon winning coach), Lynn Jennings (world class cross-country champion), and Geoff Smith cast their bare feet in the new sidewalk. Part of Boston's sports folklore was lost on September 30th 1996 when the Eliot Lounge closed its doors forever, only three years after the new sidewalk was set. The Eliot Hotel underwent a $10 million renovation and a restaurant eventually replaced the lounge. The Eliot Hotel is located in the Back Bay District at Massachusetts and Commonwealth Avenues. On the Mass Ave side of the building, to the right of the restaurant entrance, is all that remains of the Walkway of the Running Stars. The 1993 footprints are still partially visible in the sidewalk.